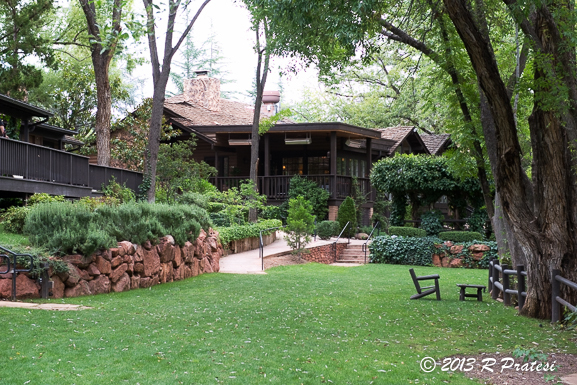 Tucked away at the bottom of a hillside below the bustling main street of Sedona, we found one of our best travel surprises on our recent trip to Arizona, L’Auberge de Sedona. 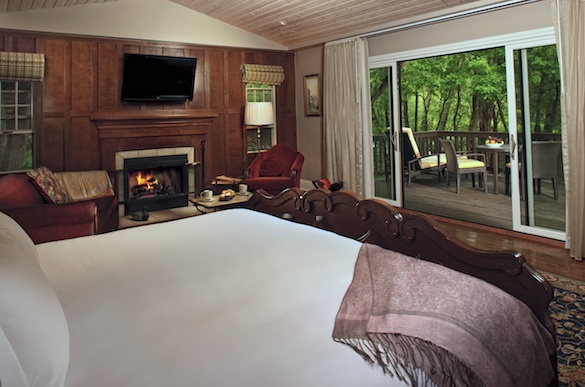 Located in a park-like setting along the the banks of Oak Creek, this luxury intimate resort has a microclimate all its own. With just a short drop in elevation, the property’s lush green grasses and cooler environment have a bit of a mountain feel, yet it is just minutes away from the majestic Red Rocks and Sonoran Desert. 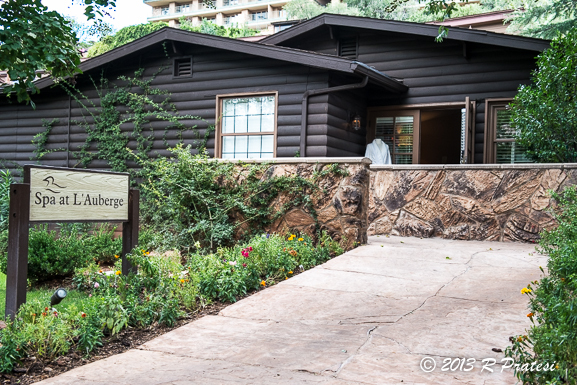 L’Auberge de Sedona is consistently ranked as one of the top hotels and resorts in the United States and the world by Condé Nast Traveler and Travel & Leisure. 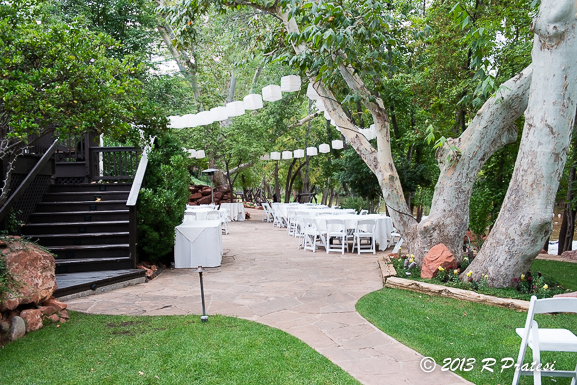 In addition, to the property’s accolades, their highly acclaimed L’Auberge Restaurant on Oak Creek is a AAA Four Diamond Award Winner and was named “One of the Top Ten Restaurants in the Southwest” by Condé Nast Traveler. 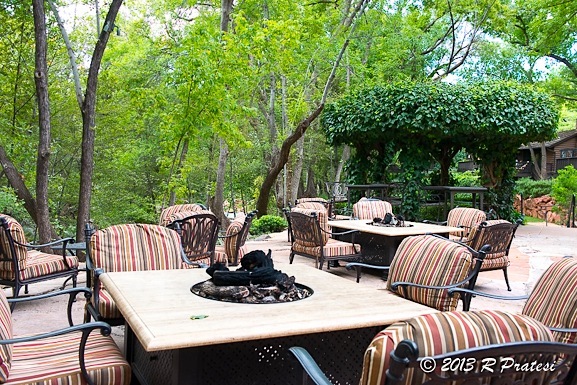 They have also received the Wine Spectator’s “Award of Excellence” for 22 consecutive years. Other properties that we visited in Arizona had a Southwest theme and adobe-style casitas, but L’Auberge was unique in its feel and design. 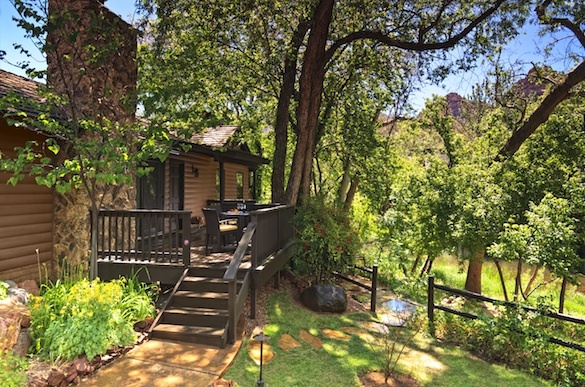 They offer individual wood cottages that are either nestled along the creek in a shaded valley setting or more contemporary rooms located at a higher elevation on the hillside with stunning views of the Red Rocks. They also offer lodge accommodations. Decorated in soothing natural tones, the rooms feature plush linens and upscale amenities. 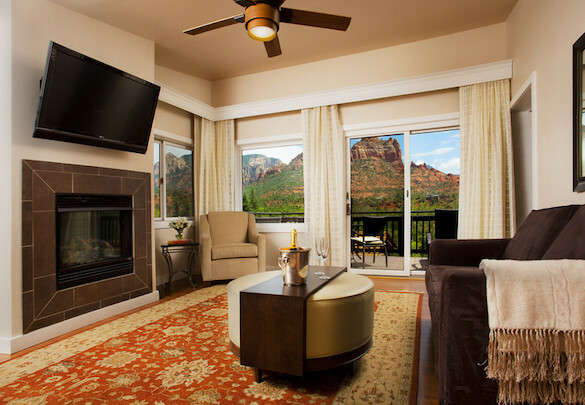 Some of the cottages and rooms have fireplaces for those chilly winter evenings at Sedona’s 4,500 foot elevation and outdoor showers to refresh and cool guests down from sightseeing in town or at Oak Creek Canyon during the hot summer months. Relaxation and renewal are two things we came away with from our two-night stay. While there is plenty to do in the surrounding area, you will be inclined to stay on-property and enjoy what it has to offer. 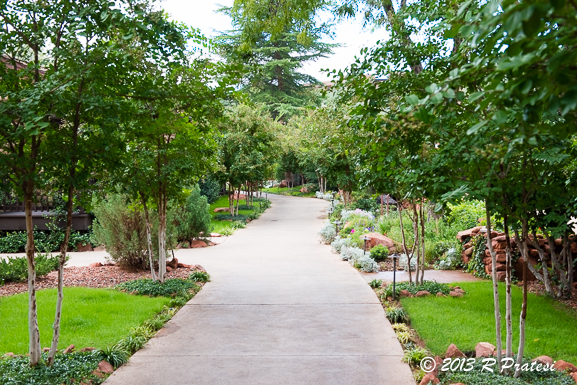 The atmosphere is soothing and tranquil with the babbling creek, shaded wooded grounds, and cooler temperatures. There are also complimentary daily activities to keep you busy, such as the morning duck feeding by the creekside, stargazing in the evenings, photography walks, morning yoga classes, and wellness talks one evening a week. A trip to the spa is an indulgence you won’t want to miss, particularly if you are there to de-stress. 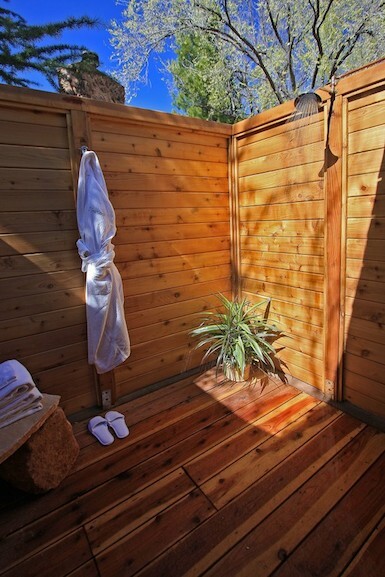 One of their signature treatments, Sedona Dreams, thoroughly completed the entire relaxation experience. I was just in Sedona a couple of weeks ago. Went the opposite of high-end this time, but I’m going back in May! I think I’ll really like this place! You will love this property and the dining experience. 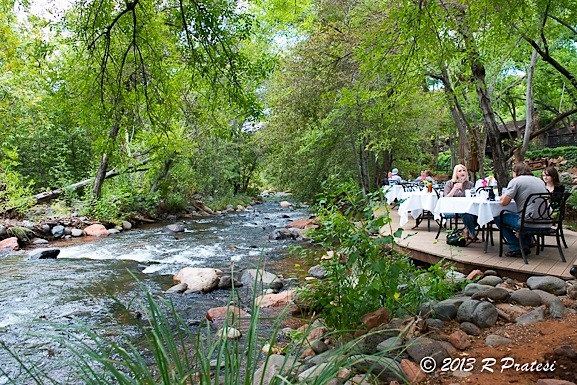 We fell in love with Sedona and it sounds as though you may have, too. Safe travels and enjoy! We stay at L’Auberge every year for our anniversary! It is such a romantic and tranquil place to stay! The staff is over the top attentive to your every need! 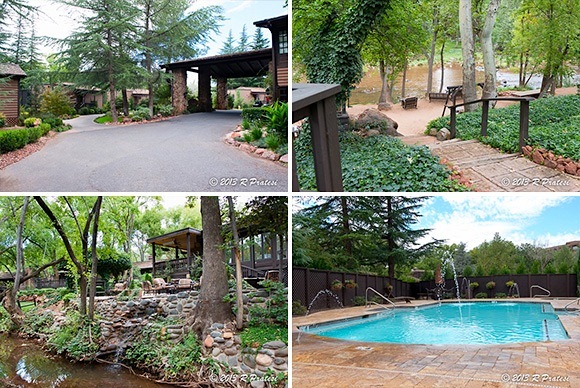 There is so much to do and see in Sedona but allow time to just relax and listen to the sounds of Oak Creek flow past your cabin! Years ago we had to cancel a stay at L’Auberge. Chef Rochelle’s creations look divine, but seeing Roger’s gorgeous photos (especially the one of the cottage exterior) has me aching to plan another trip! Yes, you definitely need to book another trip to L’Auberge. 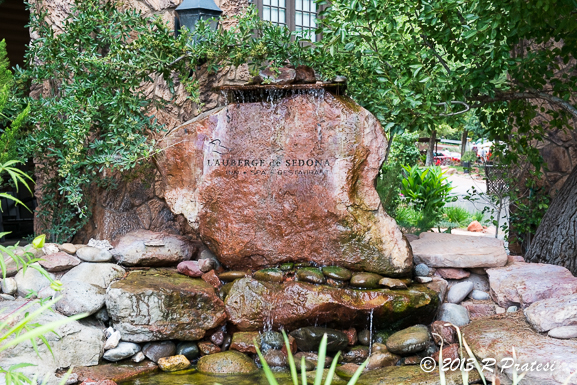 As I mentioned, this was one of our favorite trips this year and Sedona and L’Auberge were one of our favorite experiences over the two week adventure. I love Sedona so much, I moved here 8 years ago! So happy. I have a question about the recipe: By Bailiey’s Vanilla, do you mean the French vanilla coffee creamer? Or something else? There is a Bailey’s French Vanilla version and that’s what the recipe calls for.